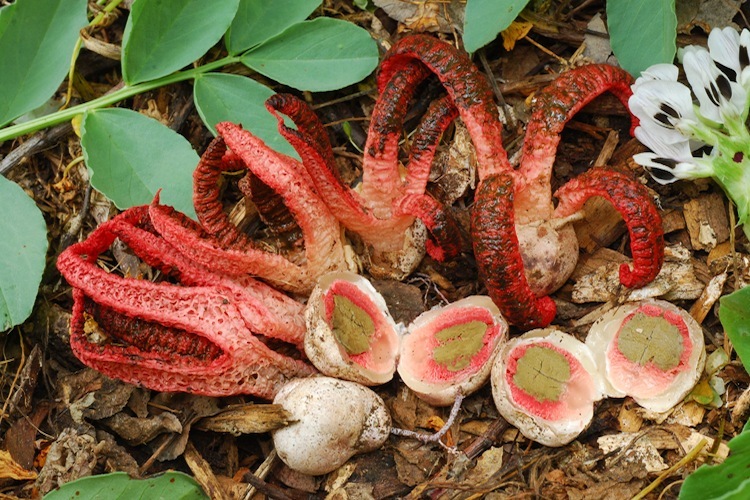 Clathrus is an amazing group of fungi that produce stinkhorn-type fruitbodies. In our area, the two known species produce structurally bizarre, bright pink fruitbodies coated in olive-brown foul-smelling spore slime that erupt from white 'eggs'. All Clathrus are saprobic, and tend to grow in cultivated or urban settings. Woodchips are the preferred habitat in our area, but deep leaf mulch in any setting can also host them. Bamboo Giant has a large annual fruiting of Clathrus archeri (usually in spring). The only native setting in which this genus has occurred in our area is riparian forest along the San Lorenzo River drainage. Only two species occur in our area, and both are introduced. Clathrus archeri is an Australian import, which Clathrus ruber hails from the Mediterranean. 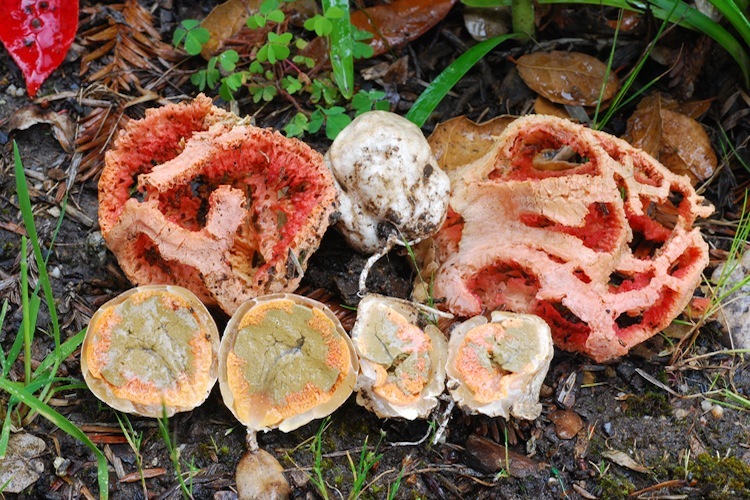 Many other stinkhorns occur in the United States, and virtually all have the potential to be imported, so a close eye should be kept on greenhouses, arboretum grounds, mulched gardens, and the like. Identification of both the genus and species in our area is very straightforward, and is dependent on fruitbody structure. Those of Clathrus archeri are squid-shaped with splayed tentacles facing up, while Clathrus ruber produced fruitbodies with a globular 'cage' or basket shape. However Aeseroe rubra could show up (especially given the prospect of a warming climate) and could be confused with Clathrus archeri. It produces similarly tentacled fruitbodies, but with a well-developed cylindrical 'trunk' into which those arms are fused. Also somewhat likely to eventually be found here is Clathrus columnatus, with arms that never detach from each other at the tip, and more rounded-grooved arms.